The city itself is made up of layers, visible and invisible, more and less obvious, whether its the pealing facade, the concentration of buildings from different eras, the atmospheric marks on buildings, the reflection of one building in another or the overlaying posters promoting events on facades and poles. The aforementioned layers are characteristics of a micro |street| level observation. 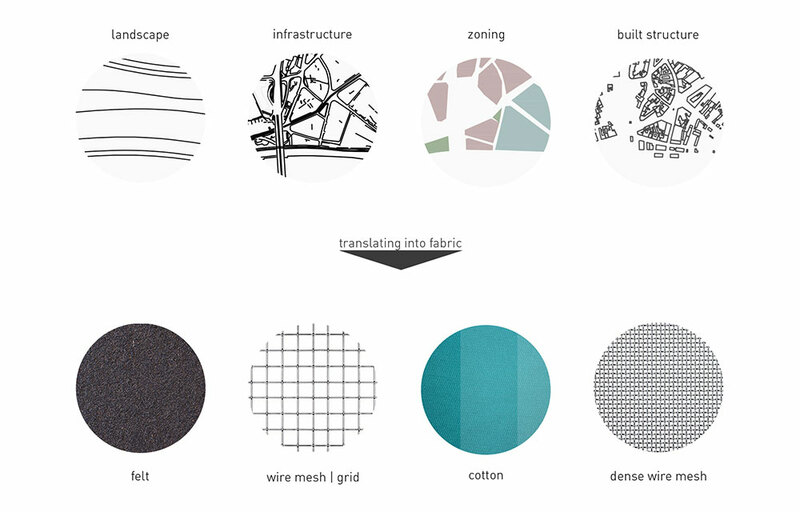 Zooming out, and looking at a city as a whole organism, deconstructing it one can see that it consists of different layers that make it function as a whole, as one system |the landscape, infrastructure, blocks, zones, parcels, built structure|. Defining the key elements |layers| and their number we wanted to transpose their characteristics and superimpose them to form a garment that is something between an architectural concept and fashion design.